From holiday get-togethers to everyday family gatherings, sometimes we need tasty recipes to a feed a crowd.Over 60 of our most delicious dishes, just perfect for large gatherings. 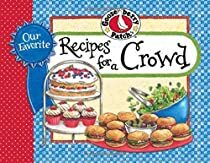 Whether you need a big batch of Crowd-Pleasing Chili for a church supper, or dozens of Cinnamon-Sugar Cookies or an Amish Brown Sugar Cake for a bake sale, you’ll find mouthwatering recipes for every big event. Plus, there are recipes for crowd-pleasing Pizza Burgers, Mom’s BBQ Beef for a Crowd…even a Cherry-Glazed Baked Ham!Give these easy-to-make recipes a try, and enjoy your get-togethers, too!Serving 12, 20 or more!